The Oscar presentation in 1989 – 30 years ago! – was a watershed in bad taste. I usually like things that are tacky and overdone, but this just stretched all credulity. It takes something special to drive Julie Andrews to trash you to the press. 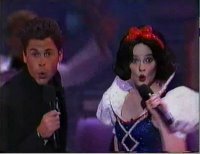 We’re going to be taking a look at the two god-awful numbers of the evening: The infamous opening number starring Snow White and Rob Lowe, and the lesser-known “Stars of Tomorrow” number which is somehow just as bad on a smaller budget. Up first: The opening number! Note: The videos and images are all taken from a second-generation copy of a 30-year-old VHS tape. I’m not apologizing, because all considering, they look good. Soak it in now, in case the Academy gets it deleted AGAIN. Up Next: Where Are They Now? So, you’ve watched the ’89 opening number. Good for you.You might wonder: What’s happened to these people in 20 years? Has Rob Lowe sung since? Are any of the Cocoanut Grove folks still with us? Want to know who behind the scenes is to blame for this catastrophe? Read on! Now that your eye bleach has had a nice time to soak in from the Snow White number, I figure you’re ready for the even more bewildering number from the Oscars 30 years ago. Nineteen of tomorrow’s stars sing and dance for, like, 17 hours straight. Featuring two Coreys, a TV doctor, a talk show host, and an actually talented person. Plus 14 other people. Grief counselors will be available if you make it through the whole thing. Obviously, since they’d wasted so much time on the opening number, the Oscar 1989 producers were going to keep the rest of the show lean and mean, right? Hell no! Who wants to find out the winners when we can spend 12 long minutes on the up-and-comers of today vainly trying to sing and dance? Two Hollywood legends tell us we’ll be seeing a lot of these faces, but how right were they? Hey! Who’s in the Audience! Sure, the Rob Lowe/Snow White opening number is awful to watch on TV, but imagine having to sit through it in person! Let’s take a look at some of the brave celebrities who endured. I didn’t realize I hadn’t posted in a year. I know I’m a procrastinator, but this might be a new record with me. Update! The podcast ThirtyTwentyTen has made it past the one year mark and is now looks back in the week in pop culture in 1987, 1997 and 2007. That means each week’s Classic Corner is in 1967 (50 years ago) and 1942 (75 years ago). In the real world, these years were terrifying – WWII and race riots, respectively – but for movies they were both interesting transitional eras. It’s gonna get weird. A sampling of what’s coming up: Raising Arizona, the original trippy Casino Royale, Jaws: The Revenge, Belle de Jour, Full Metal Jacket, Ellen coming out, Sgt. Pepper, Withnail and I, Batman and Robin, Hot Fuzz, The Pride of the Yankees, Titanic, The Princess Bride, Bonnie and Clyde and the internet’s favorite whipping boy, Bee Movie. Each episode has a Classic Corner recommendation – either a great movie from that week, or a movie that reminds me of something I like more – which are all now in their own handy list at letterboxd, where, if you’re obsessive enough, you can keep up with everything I’ve been watching. I wouldn’t advise it. I’m 95% of the way through every best picture Oscar nominee, and all the ones left are early ’30s and obscure as heck. I’ve found some hidden gems in this loooong process – God bless TCM! – so hopefully there’s a few left to keep me going. Of course, right as I hit the end of the road for best picture nominees, someone suggests I should blog or podcast them all. At one a week, that would take more than 10 years, and we know how I am about procrastinating. I finally have my own podcast…that I share with three dudes. Something something new sharing economy. I’m now a regular host and resident old person on Thirty-Twenty-Ten, where we look back at this week thirty years ago, twenty years ago and ten years ago. It’s kind of like “I Love the ’80s” with fewer bored comedians straining for laughs and more forgotten gems like Tommy Lee Jones’ supercar movie. Check it out now on iTunes. The Best Live-Action TV Adaptations – Lots of Muppets and Star Trek! The Worst Live-Action TV Adaptations – Guess who got 0 percent approval! The Worst Films By Great Directors (Part 1) – I’m not done with this topic. Not by a long shot. Good lord it’s been a long time since I posted. Because I’ve been talking about pop culture stuff in a roomful of sweaty men. You know, every woman’s fantasy. Thanks to everybody who sends me messages via Mikel’s Twitter – I’ve gotten great recommendations for classic Hollywood-themed podcasts (You Must Remember This), and people asking for my recommendations on stuff like books about the death of classic Hollywood (“Pictures at a Revolution”). If you haven’t listened to Lasertime before, I recommend that, too, even when I’m not on it and everybody gets everything wrong wrong wrong. Bad Beatles Covers: Hilarious episode hosted by Dan Amrich of Palette Swap Ninja, Probably my favorite show to date – so funny, soooooo weird. Classical Cartoon Music Quiz: You know that one music they always play in movies when they’re at a snooty restaurant? Do you know what it’s called? I quiz the guys on stuff that gets reused constantly. Awkward Celebrity Encounters: Turns out I’ve met a lot of famous people. What’s Your Favorite Future? : Blade Runner, Planet of the Apes and more, costarring my brother, a professional smart person. Robin Williams: We recorded this a few days after he died, and I think we did a good job picking out career highlights. I talked candidly about suicide in this episode, and I’m glad I did. When Actors Sing: Stars have a pretty bad batting average when it comes to cutting albums. Oscartime 2015: Now with never-before-seen footage! MST3K Turkey Day: A Thanksgiving salute to a modern holiday tradition. Killer Actors: A sort of follow-up to the on-set movie deaths episode. Conspiracy Bleary: We settle the theories once and for all. Gross Toys: A look at the ’80s heyday of toilet humor for kids, featuring the grossest things that have ever happened to us. So many things make for a terrible musical number. Get ready to see all of them. There were five production numbers in the 1993 Oscars, mostly for the best original song nominees, and ranging from “Eh” to “My eyes are melting! And so is my brain!” Charming Disney songs are ruined! Icons are embarrassed! Sailors prance! Keep reading to see the insanity realized!